I plan to use this blog to share with others how I am living a frugal life, and maybe learn a thing or two from people who read this. When I say frugal I don't mean cheap. There is definitely a difference, and I hope I can show that difference through my posts. 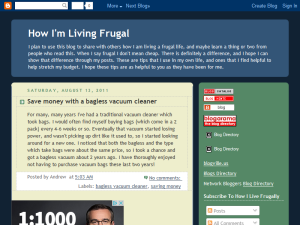 This what your How I'm Living Frugal Blog Ad will look like to visitors! Of course you will want to use keywords and ad targeting to get the most out of your ad campaign! So purchase an ad space today before there all gone! If you are the owner of How I'm Living Frugal, or someone who enjoys this blog why not upgrade it to a Featured Listing or Permanent Listing?